Using gray wallpaper in the bedroom can help you maintain that calm atmosphere while still playing with texture and patterns. After all, gray is the most neutral color of them all. If you’re wondering whether gray walls are too dull, or not interesting enough, we’re here today with 12 gorgeous examples of gray wallpaper that could work extremely well in the bedroom. Introduce natural grays into your bedroom with the Wociasmd-Wall Sticker, the prominent rusted red and gray bricks will blend in with many accessories. This wallpaper should be applied on smooth and clean walls otherwise they may come off. The printed ink is child-friendly, which essentially means it won’t fade with rough use. The manufacturer utilized durable PVC material to ensure the longevity of the wallpaper. Furthermore, this wallpaper is resistant to many elements, including fire, water, and bacteria. This wallpaper does not require much in the way of maintenance and can be cleaned with a dry, smooth rug. No two splashes of gray are alike. The differences in how they reflect natural lighting ultimately dictate the room’s ambiance. This is why the artist leverages the powerful combination of the contrasting tones in dark gray and light gray. The 3D murals are generally simplistic and will appeal to Nordic interiors due to minimal patterns. This highly versatile wallpaper can be applied to most rooms, especially bedrooms. Make sure to apply the wallpaper on a smooth, clean wall. You will have to use wallpaper glue and powder to apply it. The wallpaper is generally resistant against moisture, bacteria, and fire. If you’re a fan of checkerboards, then you should go with this wallpaper. The different hues of gray, white and black will overhaul your bedroom’s aesthetics instantly. 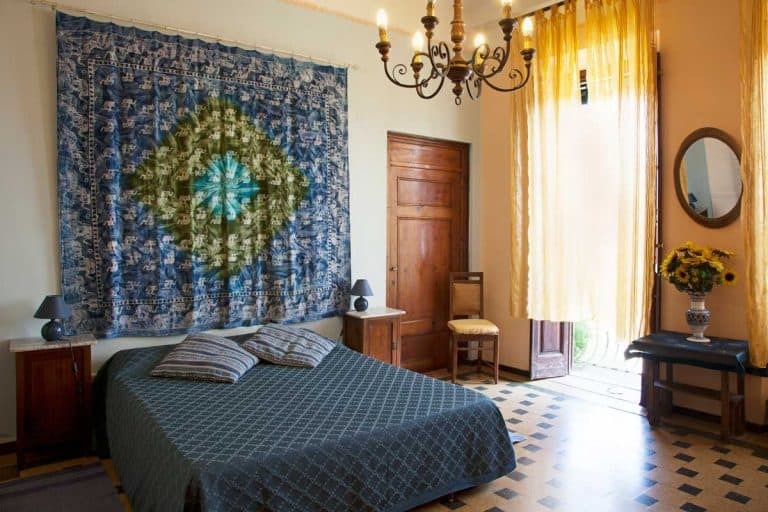 The artisan didn’t go too overboard with the design patterns, preferring to settle with the checkerboard murals without complicating it with elaborate designs. We were more than impressed with the brightness of the whites that somehow pull you towards them. Your visitors will be definitely entranced with the striking splash of white between gray neutrals, perfect if you want your wallpaper to do all the heavy lifting when it comes to sprucing up the bedroom. The fabric used for the wallpaper allows it to be used on any flat, smooth surface. It has been made with environmentally friendly fabric to reduce your carbon footprint. Furthermore, the wallpaper is child-friendly and doesn’t contain any harmful substance such as formaldehyde and phthalates. You can buy this wallpaper here. This wallpaper subtly blends into the background through its off-white murals carefully balanced against the neutral grays for some extra oomph. So if you want to overhaul your bedroom’s design without making a very powerful statement, then go with this wallpaper. Apart from the roughly vertical lines, there isn’t much in the way of design. Jian Ya Na, the artist, chose to go with a very minimal design, but that doesn’t have to be a bad thing. The wallpaper can add personality to your room and won’t distract your visitors from other architectural details and accessories. We strongly recommend buying plenty of rolls at one time to avoid color differences. Slight adjustments in color do occur because of manufacturer defects, but that is completely normal. Click here if you’re interested in this wallpaper. Rustic bricks add an industrial touch to your bedroom, which is fast becoming a trend these days. The gray bricks are complemented by a brilliant splash of ultra bright white lines, warping around the rough texture of each brick. In some cases, the white lines break into the gray bricks, a subtle touch that the artisan deliberately used to make the wallpaper look natural. 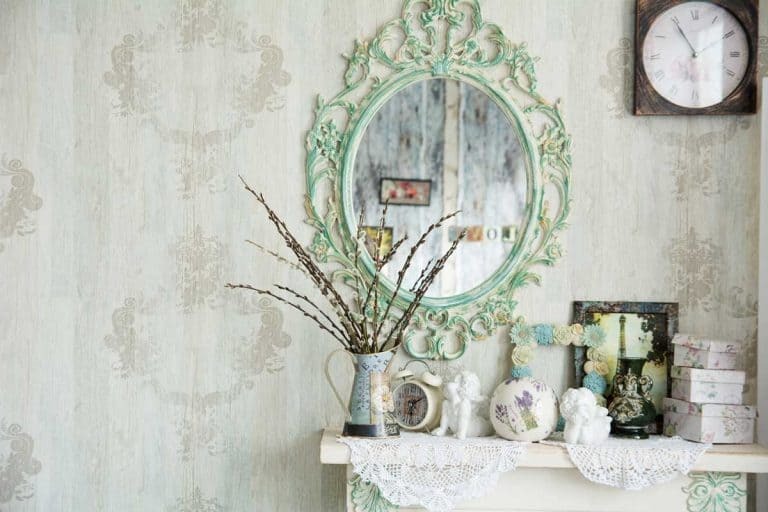 This wallpaper has been designed with ease of use and longevity in mind, so if you’re undertaking a DIY project but don’t want the hassle of going paint, this is what you need. The PVC vinyl film is highly durable and can be wiped with a damp cloth. So you won’t have to worry about the pattern fading away any time soon. Click here to buy gray bricked wallpaper. Love the bricks? Check out our article about Faux Brick Wallpaper Ideas. Tuscom is a well known brand name in the wallpaper market, and for good reason. Their wallpaper designs can bewitch users but without becoming too overbearing. This particular wallpaper delivers much the same, although it doesn’t have any designs, patterns, or murals whatsoever. But this doesn’t have to be a bad attribute. The beautiful neutral grays can be partnered with just about any color schematic in the bedroom, as is elaborated by the picture above. The product is made with environmentally friendly PVC. The back of the wallpaper will smell a little funny, but it will quickly go away once the room you have applied the wallpaper in the room. Make sure to ventilate the wallpaper for the smell to go away completely. If you want to decorate your bedroom with beautiful wall art, then AFCN has just the product for you. The artisan drew a cartoonish representation of a mountainous valley with elegant birds swirling up top. The white clouds and mountain tops powerfully complement the neutral gray background. This strikingly eclectic wallpaper can be used with most bedroom accessories and will instantly spruce up your home’s appearance. We strongly recommend you to install this wallpaper in your children’s bedroom because of the cartoonish decals. 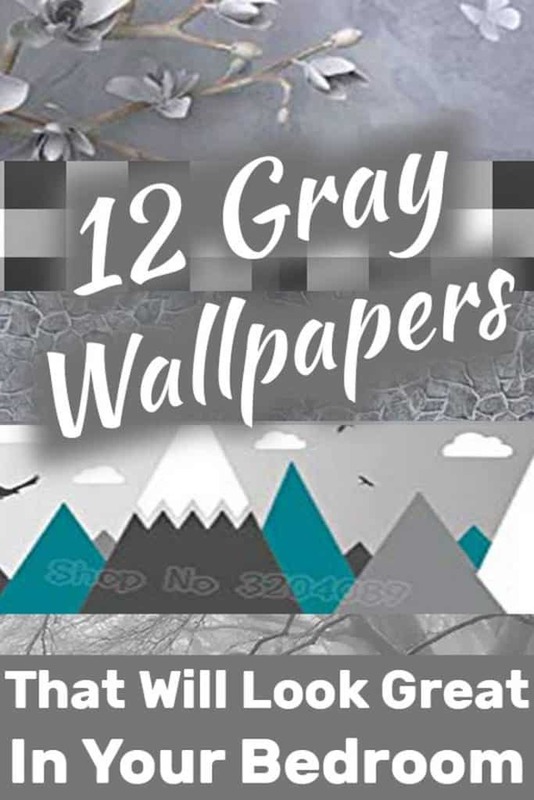 If you want plain, no-nonsense wallpaper that features a dominant gray color throughout, then go with this product. The wallpaper fabric makes use of durable ink that doesn’t fade, which allows it to be cleaned with damp water. It is fairly easy to install and remove this wallpaper, allowing the buyer to experiment with it multiple times to choose the best settings possible. The PVC material is resistant to moisture, bacteria, mildew, and fouling. These traits enhance the longevity of the wallpaper. This wallpaper has an elegant dark gray tone that goes well with most settings thanks to its combination of different shades of grays. This wallpaper has several features that we feel can make it stand out from other products on this list. It brings heat insulation and soundproofing properties to your room. If you live in a bustling metropolis with lots of traffic and want to muffle the background noise due to busy cars on the streets, you should try looking into this wallpaper. Click here to buy the wallpaper and explore these features for yourself. The artisan drew an elegant mural that dominantly features white flowers against a gray-white background. If you love Scandinavian interiors but want the elegant flowers on your bedroom, then go with this wallpaper. It comes in several sizes, so make sure to bulk order after doing your due research. It is ill-advised to order the wallpaper in batches because of tonal differences in color due to manufacture. In addition, this wallpaper is highly resistant to UV radiation, heat, bacteria, and water. 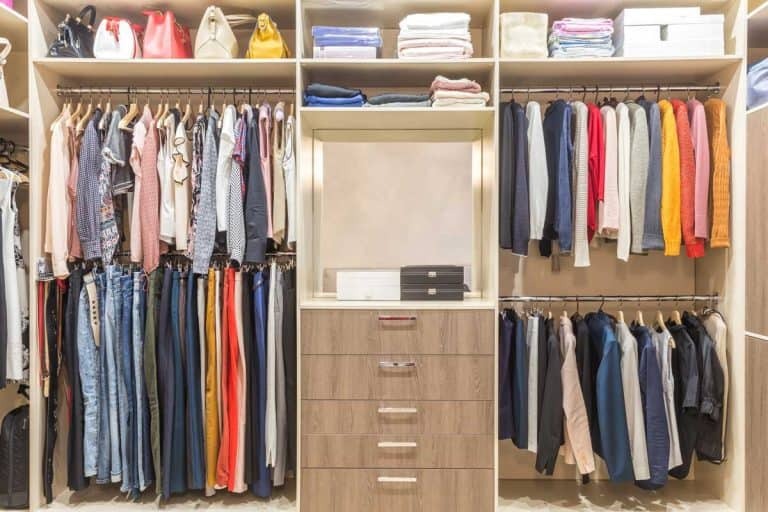 Its fabric is durable and breathable, which means it would be less likely to collect dust and dirt. If you’re impressed by this wallpaper, click here to buy it on the Amazon link. If you want your bedroom walls to take a centerpiece position in your room, then GMYANBZ may have more than delivered on this front. The trees look incredibly realistic, which thin, long branches that extend far out into the spaces. The gray fog in the background somewhat has a haunting aura, that probably may not sit well with young children. This wallpaper will look good with just about anything. Bring the isolated forests into your bedroom with this wallpaper. Wolves are powerful apex predators who dominate the wild. They have few rivals in the animal kingdom, thus commanding respect from humans. Wolves give off a powerful aura that is unmatched by any other animal in the forest, so it makes sense why people love wallpapers that feature their silhouettes on to them. The wolf looks on in peace as it stands in isolation against bright red shrubs. Show your love for wolves by decorating your room with this wallpaper. We were impressed by this style of faux wood wallpaper that has become incredibly popular. More people want the rustic, natural charm to their homes, and for good reason. Improvements in new print technologies now allow you to bring lifelike murals into your room. The textured surface of the wood is so realistic that it will bewitch your visitors. The soft whites and dominant grays only add to the aesthetic appeal of this wallpaper. Click here to buy this wallpaper if you’re going for a more vintage look.